Brewing a Scottish 70/- which turned out to be more of a 80/- . Find the Beer XML file here. The base recipe for this beer is in th Jamil Zainasheff / John Palmer book “Brewing Classic Styles”, which you will find thats where most of my recipes come from. Well after a delayed start, due to an Ill dog mashing and sparging went normal. When I fired up the burner to start the boil while I was finishing mashing I smelled a little propane, no big deal right new bottle, hot day, that must be it. As time progressed I continued to smell the gas, placing my hand where the bottle connects to the regulator I immediately noticed the leak. Turns out the o-ring at the connection had broke. Lucky for me I have a second burner. So after lifting the converted keg with about 10 gallons of wort in it off the old burner, swapping out burners, and lifting the boil kettle back up brewday got back underway. The next and possibly critical mistakes came while chilling. While moving chiller hoses around I failed to open a ball valve causing pressure to build and a chiller hose to pop off. The majority of the water went spraying harmlessly into the yard although some sprayed right down into the approx. 80F wort. The next came as I was checking the temperature and forgot to dip my thermometer in starsan before dipping it in my wort. Hopefully these wont be enough to cause an infection. Another note about this beer is I will be under pitching, according to the Mr. Malty pitch rate calculator. Partially due to experimentation, mostly due to laziness. I have never been able to create the same flavor beer with liquid yeas as I did in my early days with Saf-ale US05. So if it was due to viability or under pitching maybe this will do it again. I also left out the slight bit of roast malt the recipe calls for hoping for a slighter sweeter beer. 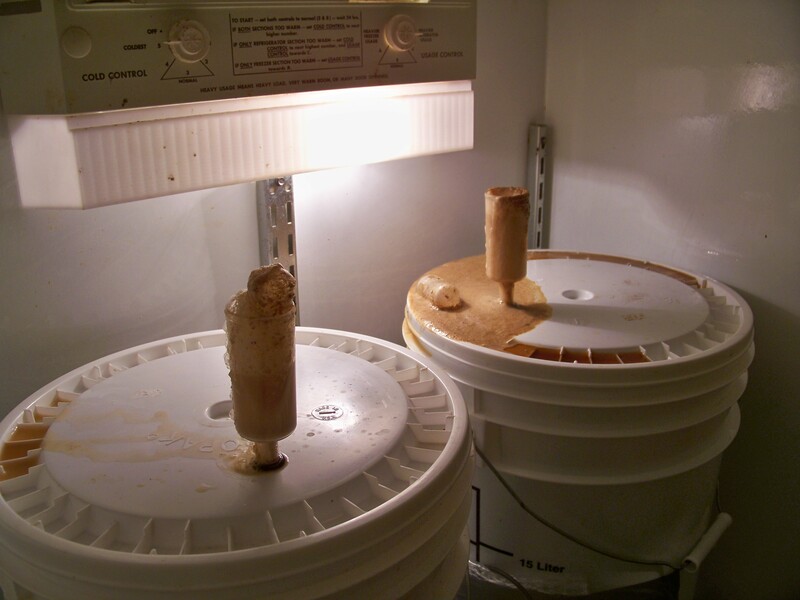 36 Hours into fermentation and this is what I come down to see. Very active fermentation. These are 6.5 gallon buckets. They had about 5.5 gallons of wort. 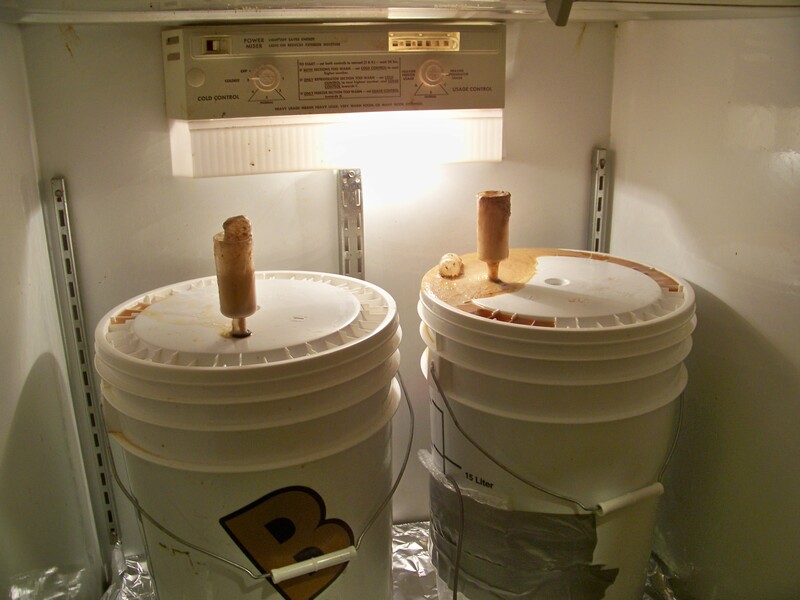 Thats a heck of allot of yeast out the airlocks. Hopefully it wasn’t due to infection. Kegged this beer after knocking the crust of yeast off the top of the fermentation buckets. It finished up at 1.011 giving it an ABV of 4.82%. After a week on the CO2 (I prefer 2) the beer is drinkable, smooth, has a soft roast character but lacks a little body for my preference. That could change with further carbonation.